Spectrum is a self-driving car service that proposes vision for autonomous driving and how that will change our way of living. Project nominated to present during the Self-Driving car session at Hyundai Global Top Talent Forum in August 2017. The objective of the project was to situate ourselves to future when self-driving cars are the norm and re-imagine the changes in people's lifestyles. The project span for little over 3 months, in which we first started out with researching about car ownership then transitioned to about self-driving cars. Based on our research, we came up with series of scenarios where self-driving cars can bring-about various impact to our society. Cognizant is a leading provider of information technology, consulting, and business process services. Cognizant combines their passion for client satisfaction with technology innovation and deep industry/business process expertise with a collaborative workforce that embodies the future of work. Three sectors that Cognizant wanted us to focus on were: IoT in retail, augmented reality as an enabler, and telematics in transportation. We chose the telematics sector, in which we looked closely at the mobility paradigm shift to come with the advent of autonomous vehicles. Vehicles are not simply a means of commute. They also represent freedom and independence in people's lives and their lifestyles. However, there are also many downsides attached with owning a car. The pleasure of driving is a fleeting joy, but for many, car is simply an asset that erodes in value and lies unutilized. Hence, many experts say that car ownership will degrade even further overtime. However, with the advent of self-driving cars, the paradigm of mobility can dramatically change. Vehicles no longer need to stay parked for hours when the owner is not in use and time it takes from one place to another can be used more productively. We focused on the millennials in or moving to suburban environment as there exists a stark difference in mobility infrastructure between cities and suburbs. 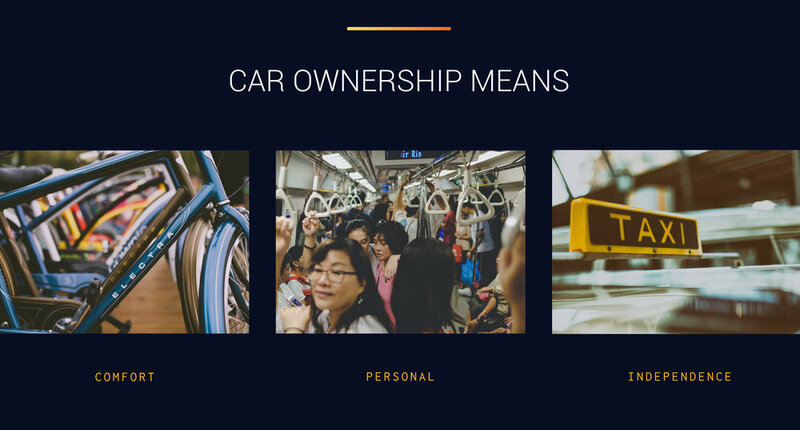 People have higher speculations on the viability of shared car ownership in suburban areas, hence the continued high demand of owning a car in suburban areas. Moreover, several media columnists have argued that autonomous vehicles would in fact reverse the forces of urban agglomeration. Millennials are lured to the suburbs by more affordable housing and better purchasing power. It is evident that millennials are still strong potential car buyers and the rise in move to the suburbs will have a positive impact in the automobile industry. We investigated how self-driving cars can augment people's ways of life. After investigating motivations for car ownership, we immersed users in a series of scenarios to enrich our understanding of mobility. Through our proposals, we are re-imagining on enabling people to utilize the interstitial space and time inside the vehicle as they move from one place to another. Moreover, enhance the sense of intimacy, enjoyment, and privacy as well as increase in agency and empowerment to people. As the main person responsible for the UI designs, I took charge of the wireframes, mockups, and prototype. I led the team in coming up with the interface flow and how each of the screens will interact with the self-driving car. Moreover, I took the role of creative direction to come up with various scenarios and situations on how people would interact and how their lifestyles will change with self-driving cars becoming the norm. Some of my other responsibilities included conducting generative tools user studies, taking part in all of the research and synthesis process. Our concept proposal and the designs are deeply rooted from research. What is a car to you? What is the mobility paradigm of the future? When does car ownership make sense? What are the emotions that people associate with cars? Through initial desk research (i.e. news articles/journals/editorials, market research on car ownership and autonomous vehicles, and car forums), we gained more knowledge about how people associate vehicles differently. We looked at alternatives to car ownership, and dived into various speculations on societal changes to come with self-driving cars becoming the norm. In our next phase of research, we used various techniques and methodologies to gain deeper understanding of mobility and how self-driving cars can augment people's lifestyles. One of the main activities that we conducted was to have people generate future scenarios and journey map people's various mobility experiences. Through this generative tools research method, we were able to better understand people's thoughts on autonomous vehicles, particularly for pick-up and drop-off scenarios, as well as some of the ethical considerations behind. It was a great pleasure working with and learning from talented peers with backgrounds in communication design, architecture, and business. The most challenging part of the entire process was transitioning and evolving from car ownership of now to imagining the future of mobility with self-driving cars. Through this project, I was able to strongly realize the importance of UX research and keeping up with the human-centered design thinking/process. I am excited to see how quickly or slowly self-driving cars will become the norm and how our visions will match up with all the societal changes that will occur.